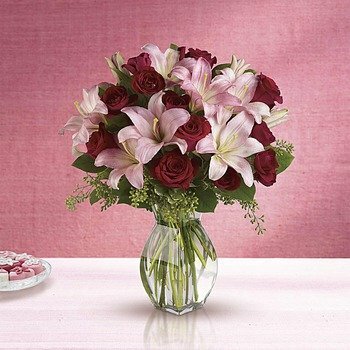 Lovely reds and pinks come together in this lavishly romantic gift. Sweetly sentimental, this combination of colors and flowers is a delightfully fresh way to say I love you. * I have tried many different sites and find that I always come back to 1st in Flowers. Great service and no worries. They also do not hide fees from you. Nothing makes a person shopping on the net angrier than going through all the screens to purchase and at the end, have to pay a $20 service fee. Love 1st in Flowers!